Lisbon is the capital of Portugal which sits alongside the Atlantic coast. It is a lively and bustling city that offers everything you could want from a holiday. - Beaches, arts, culture, great shopping, and vibrant bars. 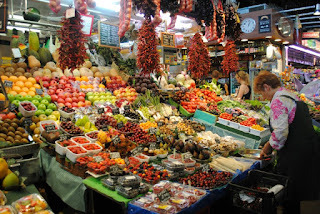 It isn't well known for it's food scene but if you are a foodie you will be pleasantly surprised with what's on offer. Ryanair offer cheap flights to Lisbon from airports across the UK including Manchester, Edinburgh, London Stansted and Glasgow. The average flight time from the UK is 3 hours. 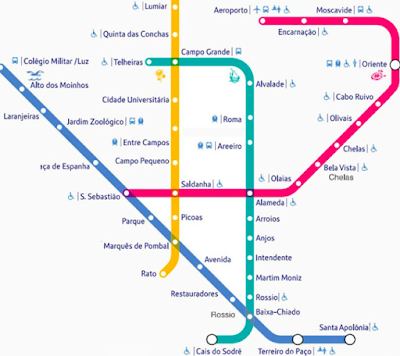 Lisbon airport has a great transport network you can reach the city centre in 15 minutes on the metro directly from the airport. To catch the metro from the airport exit the departure area to the right and head down towards the station the ticket machines will be on the left, tickets cost €3.50. Accommodation prices are much lower than other popular European capitals such as Paris, Rome and Barcelona. If you are looking for something cheap and cheerful but in the middle of all the action I would recommend Lisbon city centre apartments . It cost £106 for us to stay for 3 nights. There was 3 bedrooms which accommodate up to 6 guests so this is a fantastic bargain! This restaurant is an absolute must visit. It is busy from as soon as the doors open until they closed. The locals flock here for the fresh seafood dishes, peri peri chicken and other Portuguese classics. There is a fantastic atmosphere in the restaurant and it is a great chance to really dine like a local. Dishes start at €7.00. The Time Out Market in Lisbon is an upmarket food market which houses pop up restaurants from some of portugals best chefs. Here you can find many cuisines under one roof including Thai, Portuguese, Italian and many more cooked by Michelin star chefs at a fraction of the price you would pay in a restaurant. If you are in Lisbon on a Sunday night they do a great quiz here too. You can hop on a train from Lisbon central station that will take you straight to Belem. There is a tower which is worth a look but the main attraction here is the world famous custard tarts from Pasteis de Belem. It is on the main street in the town centre and you can't really miss it as there will no doubt be a queue outside. The tarts are freshly main on-site in their huge ovens and it is extremely difficult to replicate their unique croissant like light and crispy base with sweet and creamy filling baked to perfection. 1-2 tarts each would probably be enough but it is worth buying a few to take home (which you can order from your table) as you will no doubt be wishing you had more later that evening! I didn't know anything about Sintra until I watched a Rick Stein programme, it really is a bit of a hidden gem. It has medieval lanes, beautiful gardens filled with history and colourful castles high up in the hills. You can reach Sintra directly by train from Lisbon, its costs about £8-£10 for a return ticket. 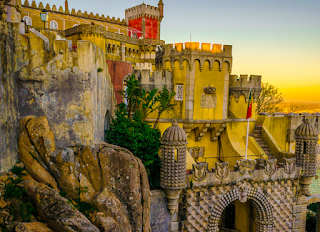 When you arrive in Sintra train station you can grab a taxi or tuk tuk up to the main town or castles however we walked up to the main town which I would recommend as there was some fantastic street artists and markets along the way. In Sintra town centre you will find a hub of small bars and cafes, they are all quite touristy serving standard burgers, pizzas, pasta etc and not much to write home but it's worth stopping for a beer and watch the traffic go by to and from the castles. If you walk straight through sintra you will end up at the stunning 20th century residence Quinta da Regaleira Palace Gardens . This place is truly something to see, you can explore under waterfalls, caves,hidden tunnels and wells. - The best thing is it feels like there is no boundaries or restricted areas. It is open between 10.00am - 8.00pm in the summer, average time spent here would be 2-3 hours. Lisbon offers a vibrant nightlife and you will find a lot of hidden gems outside of the main centre. You will know you are about to enter the real party scene when you start walking on a pink pavement 'Rua Nova do Carvalho', this area is full of lively cheap bars and nightclubs that stay open until the wee hours.